Ukraine's Prime Minister Yatsenyuk faced pressure from the president's parliamentary bloc to resign, as his own faction refused to enter a new ruling party. Several hundred people blocked the streets of Kiev on Friday to demand the dismissal of Ukrainian Prime Minister Arseniy Yatsenyuk, who was giving an annual report on the government's work in the Ukrainian parliament. The Ukrainian parliament's Petro Poroshenko Bloc said that it would not initiate Yatsenyuk's dismissal from his position until after the government passes a new budget and tax reform. Ukrainian President Petro Poroshenko has been alleged to be creating a dominant single-party state, while his former ally Yatsenyuk has declined offers to join the new party. "Today, the decision of the Petro Poroshenko Bloc faction is to in no case raise the question of government responsibility, until the budget and the tax code are passed," parliament faction head Yuriy Lutsenko said. The protesters in Kiev included supporters of the nationalist Svoboda party, as well as other parties and labor unions. Yatsenyuk's report in the Ukrainian parliament was interrupted by a brawl initiated by Poroshenko Bloc deputy Oleh Barna, after Yatsenyuk blamed the country's energy crisis on a Poroshenko Bloc member, Energy Minister Volodymyr Demchyshyn. 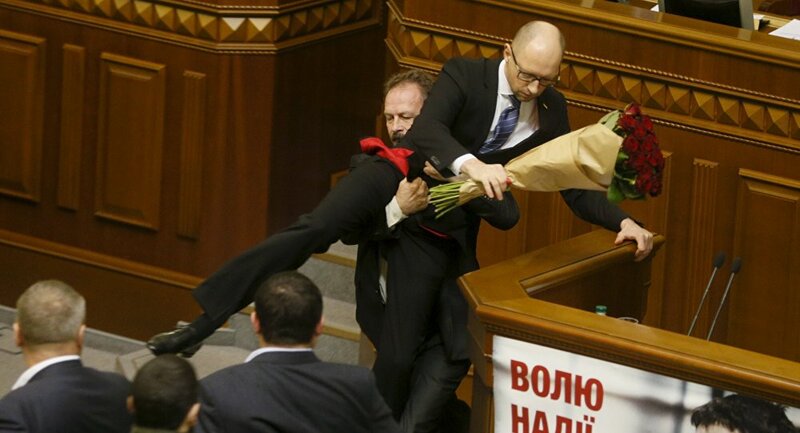 Yatsenyuk responded to the brawl, saying "Everything is okay, there are a lot of retards." Porosheko Bloc leader Lutsenko apologized for the brawl, saying that "the atmosphere created in the room provoked mentally unstable people."